Cliffhanger - Alvaro Ramírez and Clarisa Elton - are the authors of their own weekend retreat on the central Chile coastline. Great residential design, propped on stilts, with minimal environmental impact. This great house is located on a remote coastal trail in central-south Chile, in Buchupureo, VIII región del Bío-Bío. When I lived in Concepción, the capital of the region, we'd surf here. The waves were fantastic, rolling into all the bays around this area. Getting there was difficult and the water was freezing (pushed up from the Antarctic), but the untouched waves, scenery and beaches were, and are still, amazing! The project was developed in dialogue with its environment, both through the materials used for creating the volumes, as well as how these are implemented and placed on the site. 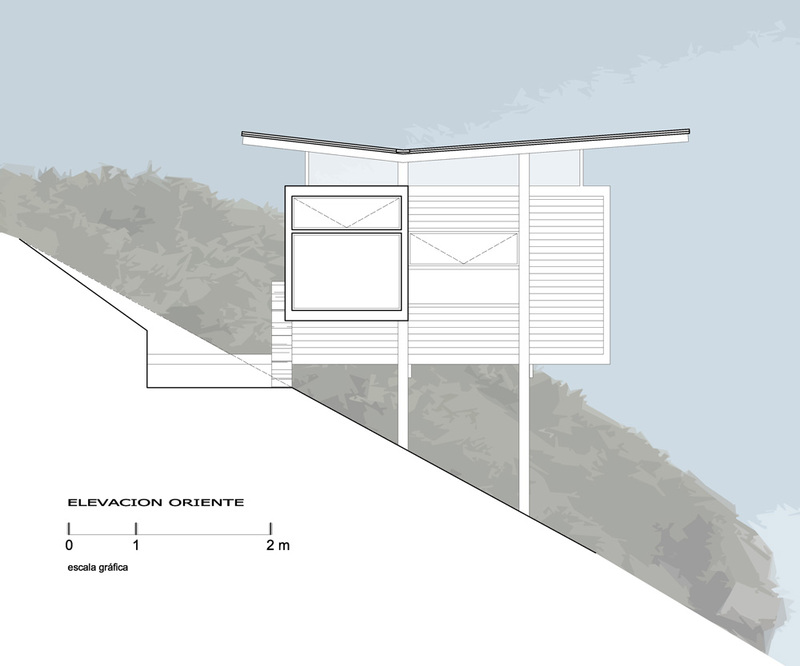 The house is supported on a steep slope through piles, which lessen the intervention/excavation of the plot's soil, allowing in turn, the free passage of water. The cabin is divided into three functional spaces, relating to the three requirements of a holiday house. A bedroom with bathroom; a space for entertaining and guests - being with the kitchen; and a terrace, linking the other two spaces and providing spot for those spectacular views. All spaces seeking panoramic view towards the Pacific Ocean. The terrace serves as the lobby space, an intermediate space, as it is located between two interior spaces, providing protection against the wind and and as a place to embrace the ocean. 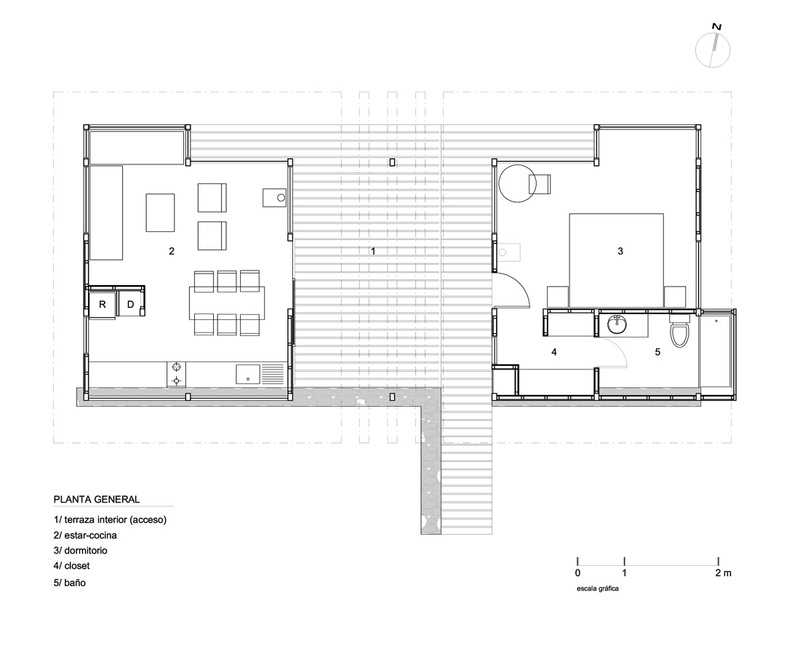 The structural elements of the house are left visible, giving form to the shape of the house. The structure, external and internal elements, are all created from local wood (the equivalent of Radiata pine), yet treated differently depending on their role. For the pillar structures and beams pieces of 4 "x6" 2 "x6" and 2 "x5" were used. All were treated to give them protection against moisture. For interior cladding, ¾" x 4" pine are used,brushed, without any treatment. Finally for the external cladding 1" x 4", painted with carbolineum. 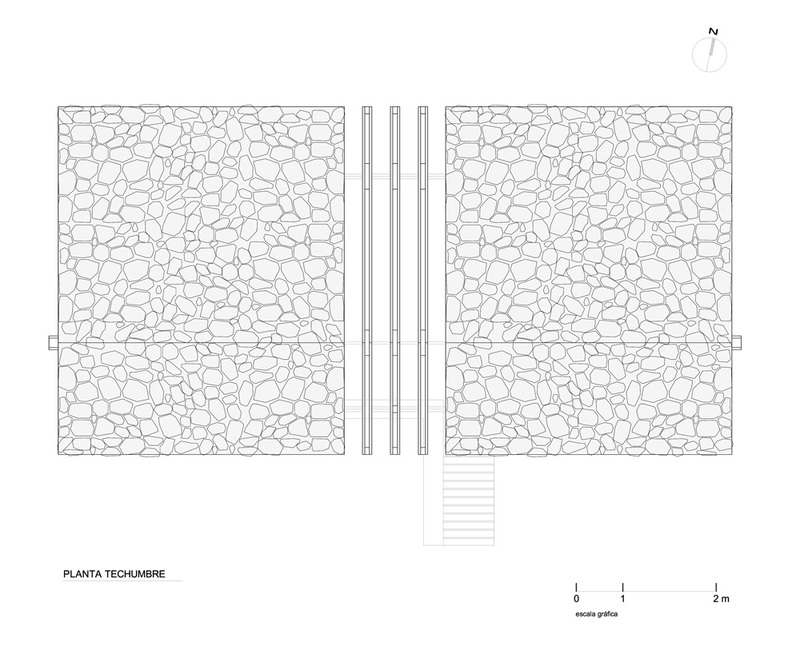 The tectonics of the project establish a close relationship with the local architecture, using wood and 'laja' stone, materials predominant in the area (most of the fences in the area are built with laja stone and mud, as well as many old house floors). The structure of the roof is wood and in its V design, it detaches itself from the wall structures at both the front and rear of the house. This letting light into the interior,generating a feeling of spaciousness. Laja, the stone used to cover and protect the roof, was thought of as an element of both cultural adaptation (local architecture) and natural (landscape elements), blending the building into the rocky shores below. Conversely the view up from the beach sees the timber framework match the colours of the cliff face, the house's home.